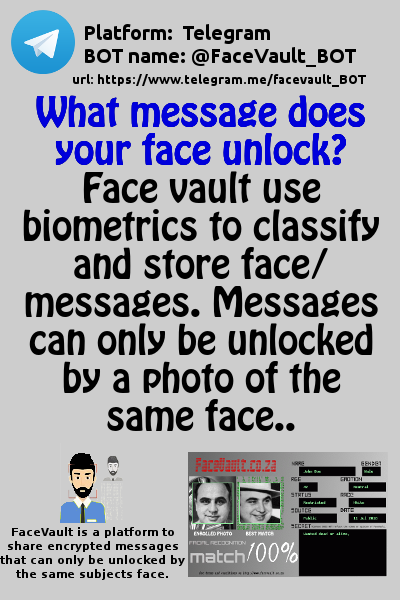 We specialize in securing hidden messages only unlocked with a certain face - what message does your face unlock?. Hide messages in plain sigth. Encrypt a secret message for your friends with your face. Remembering that face you tend to forget by hiding his name in his face. Security groups hide secret messages related to a face for other to decrypt from a suspisious character. Lookup friends and see what message is hidden in there face. Send a image to one of our service BOTs on Telegram, Whatsapp or Wechat (or use our API to develop from and use our datasets). Sometimes it's needed to use your own private face dataset based on your own users contributions, our easy to use howto's will guide you through the process. Q. What are the requirements for using this service? FaceVault is available on all major instant messaging platforms. * decryption messages are limited to message length on the free plan. "National database on socially generated suspicious/wanted vehicle number plates." Fighting Crime through Social Intelligence. "Location based platforms for ever demanding users."